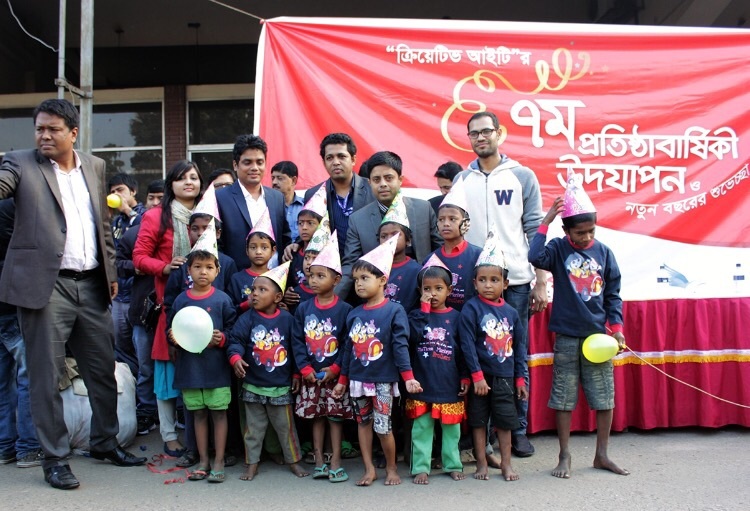 Leading IT organization Creative IT Ltd. celebrated its 7th Anniversary and Happy New Year-2015 with city’s 500 street children on January 2 (Friday). On the occasion winter pitha and winter clothes distributed among the children apart from displaying creational magic exhibition. The magic was exhibited by Ulfat Kabir. The programme was arranged at the open space adjacent to Kamalapur Railway Station from 8 am to 11 am. Chairman, Creative IT, Monir Hosen inaugurated the programme, where Secretary, Ministry of Education, Nazrul Islam Khan, Senior Manager, Safe The Children, Kabir Akon and Executive Director, Bangladesh Computer Council, S.M. Ashraful Islam were present as special guest.